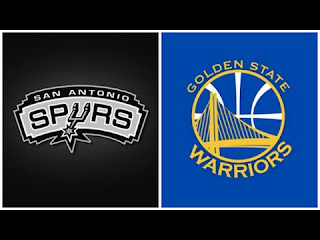 It's the Golden State Warriors versus the San Antonio Spurs in the Western Conference Finals of the NBA. The Warriors already swept their opponents 4-0 the Utah Jazz. With the Spurs defeating the Houston Rockets 4-2, they have now the right to challenge the straight winners the Warriors. So will it be a Parker and Curry show? One way to find out. 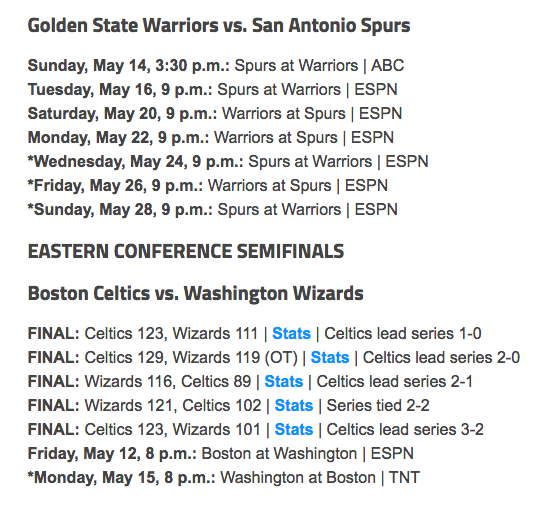 Both teams have an axe to grind against Lebron James so lets see who prevails. Check out the succeeding game schedules. The standings right now as of today May 12, 2017 (Philippine time). 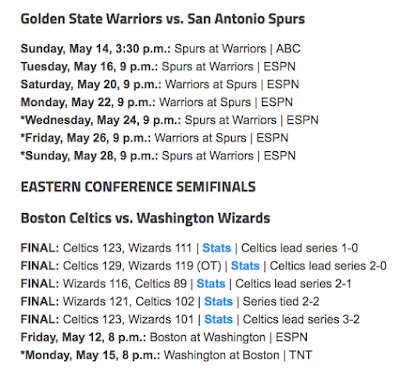 The Celtics are 3-2 against the Wizards right now so its exciting to see the game tonight, (its saturday morning for us Philippines) who will be the opponents of the waiting Cleveland Cavaliers for the Eastern Conference Finals.